Regular earbuds have one major problem: they are not very good with the noise. First, the microphone is placed outside, and the distance between the mic and your mouth is too far. So, the mic already picks up all the ambient noise when you begin talking. When you speak while having your ears plugged, you can still hear your voice. That’s because voice not only goes out of your mouth but also travels internally through the Eustachian Tube. Using this idea, we placed a microphone inside the earphones to pick up the voice and to block off the ambient noise. When a microphone is placed in front of the speaker, feedback occurs and howling noises are made. That is why there is hardly any company that was successful coming up with inner-mic earphones. However, we made this possible through our patent-protected howling & echo removing algorithm. 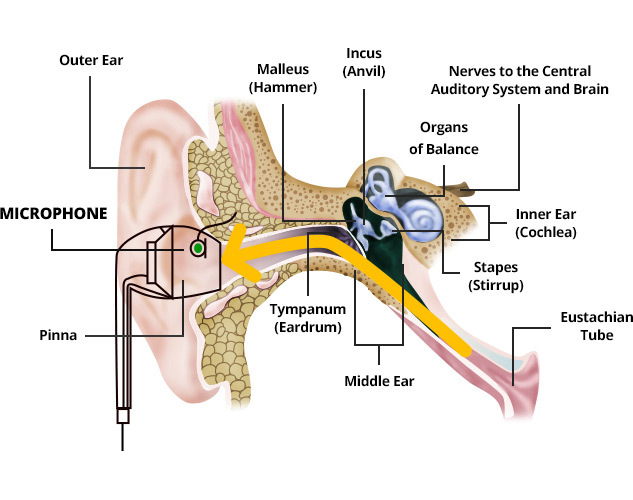 Using InnerMicTM alone or even regular earphones have one significant problem: User’s voice gets thickened or distorted. This problem occurs because voice that travels through Eustachian Tube projects up to 2 kHz in frequency. Although people can still hear you, voice comes out muffled. To solve this problem, Orfeo SoundWorks has finished developing VoiceRecoveryTM Technology. Using this technology we extend the bandwidth of voice frequency. Furthermore, VoiceRecoveryTM touches upon the input voice so that it comes out as your original voice. Orfeo Bluetooth earphones have another microphone outside of the earphones. SoundThruTM Technology serves to utilize this outer-mic to let surrounding sound to come in when it is necessary. For example, crossing the street with ears plugged can be quite dangerous. A Car or bike might be coming and honking at you but you wouldn’t be able to hear it. SoundThruTM allows you to turn on the outer-mic via Orfeo Control mobile application and you can hear the world around you if necessary. Remember that SoundThruTM Technology is supposed to enhance safety feature while listening to music. It should not be used for phone conversations.